Occasionally I want to install an application which requires certain permissions that I feel it really shouldn't need. Can I install the app without giving it these permissions? For example, GPS location, phone state, internet connection, etc. Is it possible to change the permissions of an application once it is installed? No. Without a custom ROM it's an all-or-nothing affair. Which is part of the reason Google encourages developers to ensure that they're asking for the absolute minimum permissions required for the app to work. Short of getting the app code and modifying it, you either need to accept the access request or not use the app. Some alternatives exist if your device is rooted. There's a semi-hidden permissions manager (App Ops) that can be reached through a third-party app, but doesn't require root or a custom ROM. Android Police has covered it here. Note, however, that Google has said that this was released in error, and newer versions of Android have once again disabled this. Additionally to above mentioned App Ops, here you can also use the Xposed Framework (for Android 5+ see here) with modules like Xprivacy or Protect My Privacy. While this will require your device to be rooted, it offers additional functionality. marcioggs outlined functionalities provided in Android M in a separate answer. CyanogenMod 7 supports this. It activated by going to Settings->CyanogenMod Settings->Applications and checking "Permission management" as of the most recent build. You can then allow and disallow permissions by choosing an app from the app management list (Settings->Applications->Manage applications). There is an article on endgaget with a Youtube demonstration. Disclaimer: This may be obvious to some, but denying permissions to an app could have fairly crash-tastic consequences. Nonetheless, if you have a device that is supported by CM and you are willing to root and install it, you can enjoy permission-by-permission control (and any hazards that come with it). In fact, due to the crashes that the permission management implementation tended to cause, it was removed from the CyanogenMod codebase in version 9. However, the most recent nightly builds of CyanogenMod 10.1 now include a feature that has been dubbed "Privacy Guard". Instead of blocking apps from accessing data that they request, Privacy Guard will provide them with blank data. As an example, if an app running under Privacy Guard requests your contacts list, CM will simply return an empty list, causing the app to functionally believe that you don't have any contacts stored on your phone. There is an App Shield application. It essentially repackages .apk with permissions removed from manifest. Brilliant idea for stock, non rooted phones. Subject to crashes (force closes), though, as with CyanogenMod (as of version 7). Update: App Shield seems no longer to be maintained. It currently can be found in some "personal Aptoide repositories", e.g. at Mixal and Karbyfio. It is recommended to rather use something more up-to-date now. 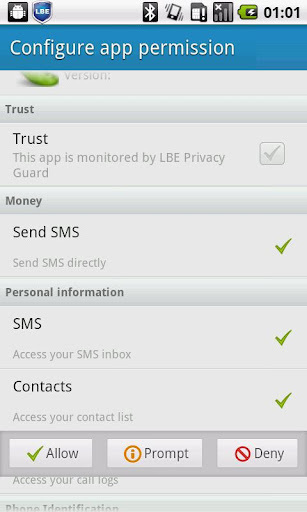 NOTE: LBE Privacy Guard is no longer maintained and only available for Android versions below 4.2. Warning: if you are on Jelly Bean (Android 4.1+), be sure to check whether LBE has been updated for Jelley Bean yet. At the moment (July 27 2012) it is still incompatible, and it will cause your device to boot loop on Jelly Bean. That means you may have to factory-reset your device. Xprivacy is now recommended instead (root required). LBE Privacy Guard can block specific permissions per application, both during installation and afterwards. This is the English version of an apparently Chinese application that has existed for a while (I am not in any way affiliated to them); it already has over 100,000 downloads. I haven't tried it yet, but I plan to do so tomorrow. Show all apps that uses a specific permission. You can use the Xposed Framework along with the App Settings Module to deny application permissions. You can also use it to change DPI settings allowing apps to run in tablet mode on phones and vice versa (along with changing the size of things in general). It works beautifully for me. You will need root to install it, though. Thanks to Izzy for pointing out the need for a module. As per their comment you can also use Xprivacy or Protect My Privacy to achieve this control. I stumbled upon this app called Permission Remover that allows you to remove permissions from the APK package before installing it. Worked for both installed and downloaded APKs. This method is convenient as it does not require you to root your device. Fine-grained app permissions are not present in stock builds of Android up to version 5.1.1. 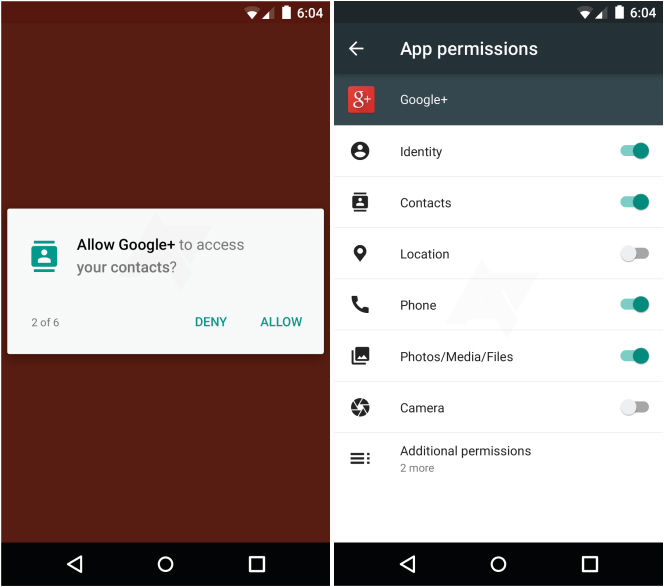 Google has introduced a new permissions model starting with 6.0 that includes fine-grained control. However, if you've gained root access on a device running version 5.1.1 or below, there are options for adding this feature to your device. Head over to xda-developers.com and search for "xposed framework" to get info on how to install the framework. After installing the framework, install either the XPrivacy or the App Settings modules to get more control over each app and their granted permissions. Go to Cyanogenmod Downloads and see if your device is listed. If it isn't, head back to xda-developers.com and go to your devices forum page to find a list of ROMs for your device. Look for anything referring to "cyanogenmod" or "cm" in the original post of a ROM thread to find the right base to give permission control access. A good app (which is not in in playstore anymore since 2016) by root uninstaller: To withdraw an app just the right to enter internet in CyanogenMod you can use Root Firewall (needs root). It can block internet access for any apps. The free version can already block either all apps or just block up to 7 distinct apps. Not the answer you're looking for? Browse other questions tagged applications permissions installation or ask your own question. How to revoke permissions from applications? How can I control the permissions an app has if I am on a rooted android? Revoke App Permissions Without Root? Is there any way to block permissions on apps? How do I withdraw an app rights to enter internet in CyanogenMod? How to track links that certain app accesses? How to avoid leaking private data to apps without rooting my phone? Is it possible to run android without a screen on plain phone mainboard?